Baking is something for me that requires me to follow rules (such as the fact that butter needs to be cold if you are going for a pie pastry, like in these lemon tarts, but it has to be at room temperature if you make a pound cake and mix it with sugar, such as in this apple-rosemary pound cake. Yet, at the same time baking can be experimental. It doesn’t necessarily work out all the time, but if it does, then it is really exciting. When I discovered this photo competition for baking/cooking (German), it got my creative side out. The idea of this competition is that you get inspired by one of twelve paintings when you create your recipe. I decided for the painting below, which is by Henri Edmond Cross and is called “Afternoon in the Garden” in English. I was fortunate enough to spend my share of holidays in the south of France. Aix en Provence is a place very dear to me. When I think of south of France, I immediately think of the daily routine of going to the boulangerie (bakery) to get baguette or croissants. I also think of lavender fields, olive groves, or drinking lemonade while waiting in the shade for the heat to pass, snacking on some goat cheese. It is an idyll, definitely. The painting inspired me to capture some of this atmosphere during my holidays. 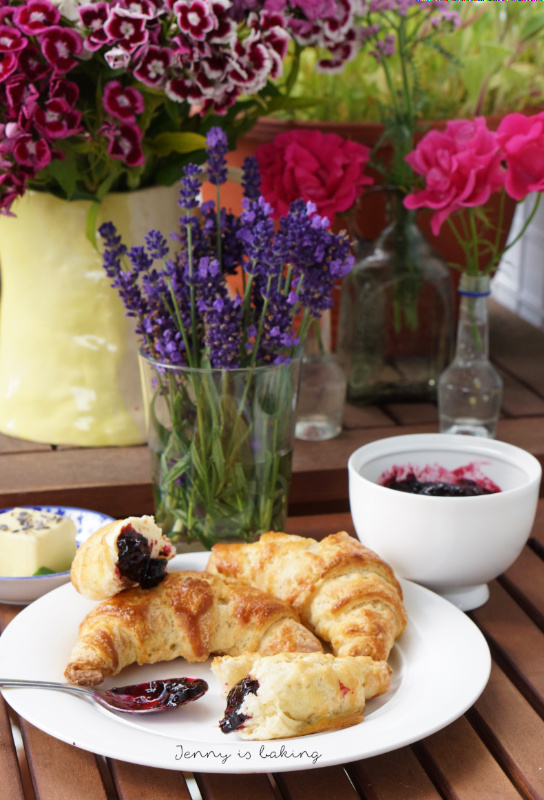 I decided to make homemade croissants and to pick a lot of fresh flowers. The jam is also French-inspired. It is made of blueberries and raspberries with a hint of thyme. The butter contains some crushed lavender. The south of France to be found on your breakfast plate. 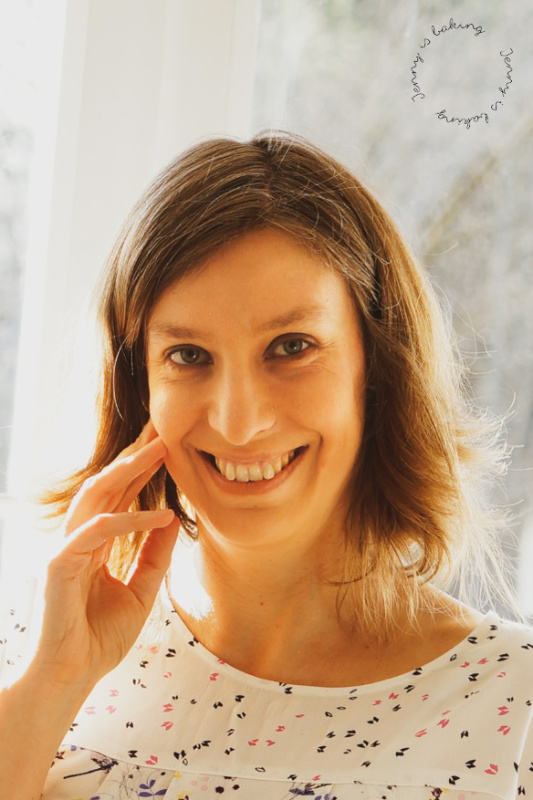 If you want to vote in the photo competition, please check it out here, no German needed. Just click through the pictures at the bottom of the site and give five stars to your favorite (obviously I would be happy if you choose mine). 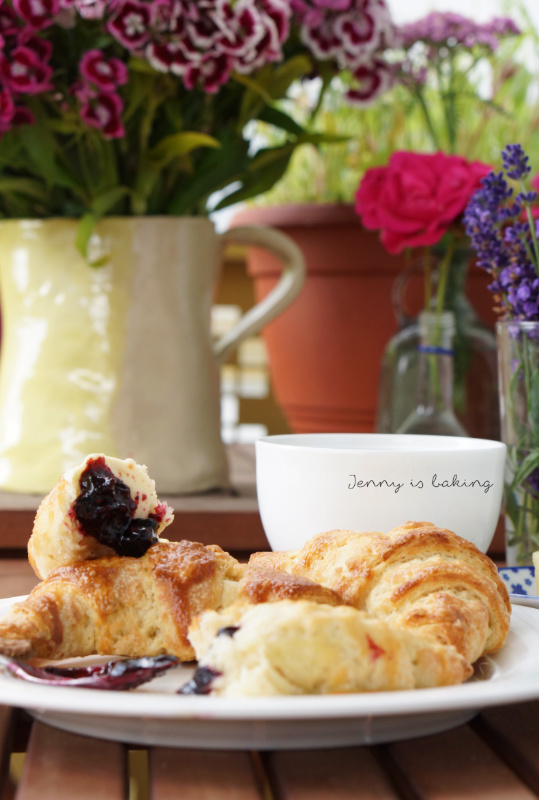 OK, after so much talking, let me introduce you to homemade croissants with blueberry raspberry thyme jam, my personal invitation to the south of France. For the croissants heat up the milk until it's lukewarm. Add 100 grams of flour and the yeast and stir. Let sit for 10-20 minutes until foamy and bubbles show. Add the remaining flour, sugar, and salt and knead until you have an elastic dough, this takes a few minutes. Form into a ball. Cover in plastic wrap and chill in the fridge for at least two hours or over night. Take out butter from the fridge and put butter between plastic wrap. Now you have to roll out butter into a square of 20cm. I find it easiest to first press it down with my hands and body weight and then start rolling it with a rolling pin. Once you have the square, transfer back to the fridge with plastic wrap and all. Take out dough from the fridge and roll out to a square of 40cm. Don't roll it out too thin. Place the butter inside the dough diagonally without the plastic and wrap the dough around the butter like an envelope from all four sides. It is most important that the butter is covered in full by dough. Now roll out the dough into a rectangle of around 20x50cm. From this stage on you should try to roll out the dough always in one direction only. Also, don't apply too much pressure as you don't want the butter to come out at the ends. If butter comes out, cover area with flour or some small dough pieces. Now fold the dough into three layers as you would fold a business letter. Wrap again in plastic wrap and transfer to freezer for 20 minutes. Repeat steps 8-9 three times in total, so roll out dough, fold like a business letter, and freeze 20min. After that cut the dough folded lengthwise. Transfer one half to the fridge. Roll out the other half until about half a centimeter thick. Now cut out triangles. Best is to first cut stripes and then diagonally have triangles. Take one triangle and start rolling from the widest end. Form to a half-moon and place on baking sheet with parchment paper. Repeat with all the dough. Cover with kitchen towel and let rise until double in size. Shortly before baking brush croissants with egg/cream mix. Bake at 190 degrees Celsius for about 20 minutes. Depending on your oven, it may take longer or shorter. Check once croissants are golden. For the jam place the berries and sugar in a large pot on the stove. Bring to boil and boil for about 3 minutes. Pour immediately into clean jars, seal, turn upside down and let cool. 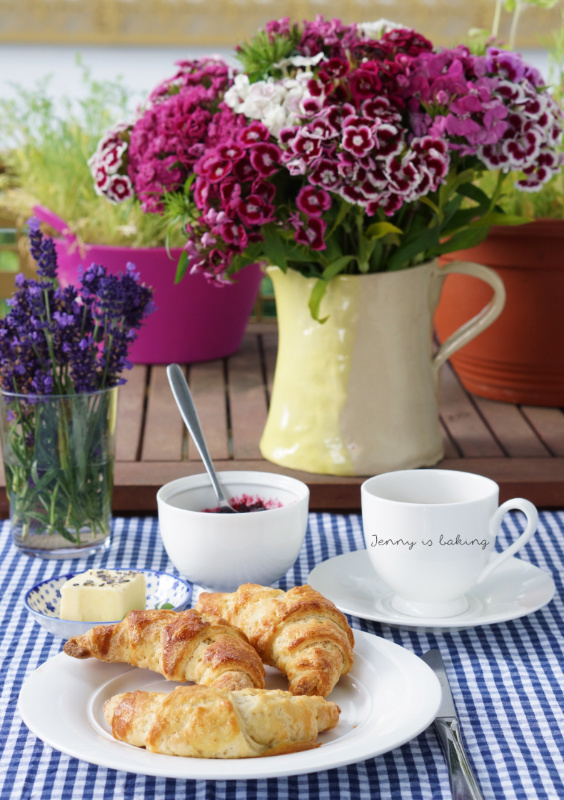 Enjoy the next day with the croissants. You can prepare the jam and also the croissants mostly the day before. Prepare until step 13. Chill in the fridge over night. Make sure you let the unbaked croissants come to room temperature for two hours before you bake them. your croissants look so good, well done!! Thanks, my first try and soooo delicious! Your croissants look delicious! And the jam sounds delicious too! I really enjoyed all the flowers in your photos, and also the painting! I have never been to the south of France, so this post gives me an idea of what it is like. Thank you for sharing! 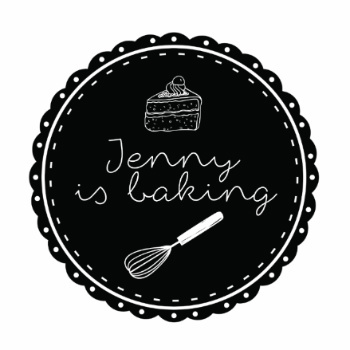 Hi Jenny, thank you for your kind words and let me know if you try either of the recipes! What a perfect thing to spend my morning with! 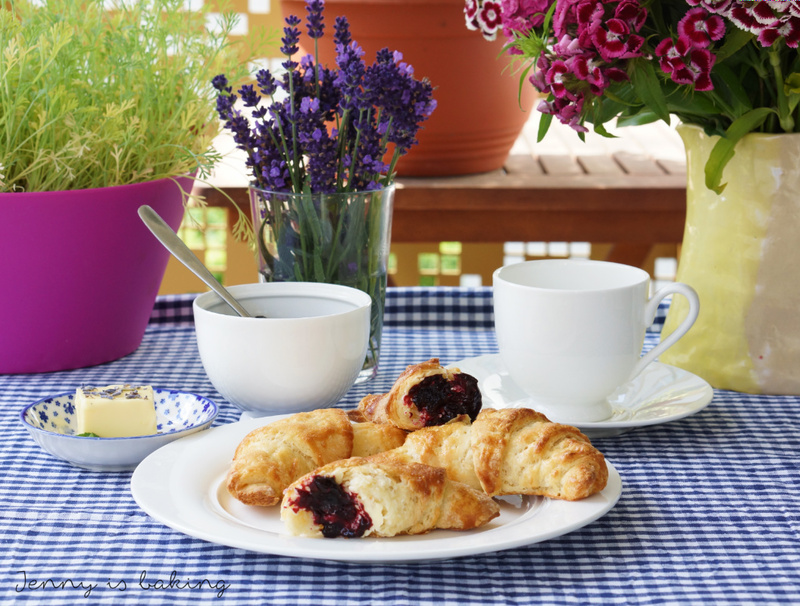 These croissants sound fabulous! Thanks for sharing at Fiesta Friday party! Happy to do so and thanks for dropping by!